KOTO, VIOLIN was composed for Terrie Baune and Shoko Hikage and was premiered at the San Francisco International Arts Festival in 2016. 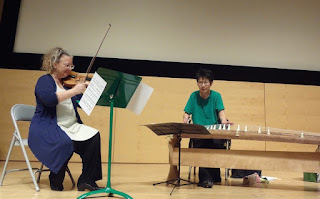 In KOTO, VIOLIN, the materials used are very limited, and there is no development of these materials. DIRGE was completed in November, 1997 and was first played at Stanford University in January, 1998. Much of the melody in DIRGE has its origin in Sanyombul, a Korean folk song. The words to Sanyombul state: The sun that sets will rise again tomorrow / A life that passes will never return. This piece was inspired by the way clouds move quickly and unexpectedly, always changing in shape and shade, floating and scattering. It was commissioned by the Zellerbach Family Foundation.